One of the simplest and most popular progress-focused techniques is the circle technique. One of the situations in which this technique is useful is intake sessions. An intake session is a preparatory conversation with a potential client. The purpose of intake sessions usually is to determine whether the professional will get the assignment and to clarify what the outcomes of the job should be. Here is an example of how the circle technique can be used in these situations. As an example, I will use a situation in which a manager invites me as a coach for an intake sessions for coaching with one of his subordinates. This is a type of situation which many coaches run in to from time to time. In such situations I use the circle technique as follows. First, I aks the manager what the outcomes of the coaching should be. It often happens that the manager answers in negative terms at first. For example, the manager may explain what the subordinate should stop doing (for example communicating bluntly). When that happens, you, as a coach, can proceed by asking questions such as: "How will you notice, after the coaching process has been completed, that the person communicates more effectively?" You keep asking questions until you can write down specifically and in positive terms what the coaching's outcomes should be. Then, you proceed to the inner circle in which you will write down what does not have to become better because it is already going well. By asking targeted questions you can get a clear picture of which specific things the person is already doing well. You write these things down in the inner circle. 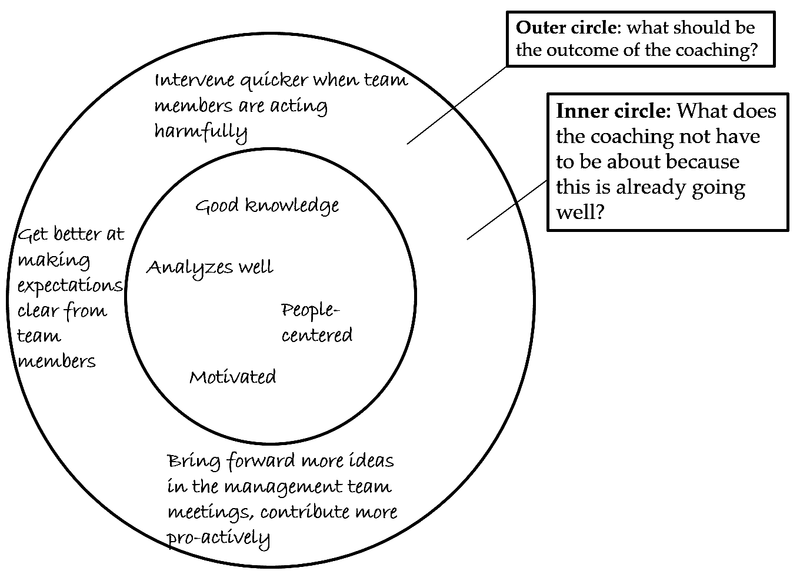 These two circles now give you a clear description of the goals of the coaching (the outer circle) as well as a clear demarcation (the inner circle). This way of working is not only informative for me as a coach but also for my client. Firstly, clients will often feel helped by being able to express the goals in specific and positive terms. Secondly, clients are helped by filling the inner circle. This helps the client a more nuanced and optimistic view on the coachee by realizing that the person is already doing many things effectively. In the first conversation with the coachee I use the very circles which I have drawn and filled during the intake session. First, I ask whether the coachee already knows that have done the intake session with his or her manager. Usually this is the case. Then I ask whether he or she would like to hear what I have understood from that intake session about the goals of the coaching. Nearly always, coachees want to hear that. Next I read, rather quickly, what is in the circles. I use my notes from the intake session and begin with the inner circle. This usually surprises coachees pleasantly. Seldom they expect to hear such positive feedback at the beginning of a coaching session. Then I go on to by reading what is in the outer circle. Once I have done that, I ask the coachee whether I have understood the goals of the coaching correctly. After that, I ask the usefulness question. Coachees usually find this a pleasant beginning if the coaching session. I am very open about the information I have which creates an open atmosphere. The coachee has the opportunity to listen a bit and to see which way the wind blows. When it becomes clear that I only mention positively formulated terms (the outer circle also only contains positive terms) usually an open and constuctive atmosphere emerges quickly.